Consumer Federation of America is a nonprofit research, advocacy and education organization. CFA does not handle consumer complaints. There are agencies and organizations that you can contact if you need help resolving a complaint with a business or you want to formally report a problem. There are a variety of consumer agencies in every state. These agencies provide information about consumers’ rights and how to resolve problems, and many mediate individual complaints. Some state or local consumer agencies also license or regulate certain kinds of businesses, and some take legal action to stop illegal practices. Before making a complaint, you may want to call the agency to confirm that it handles the type of problem you have. Start with agencies in your state; in some situations you may be referred to an agency in another state or to a federal agency. Note: Toll free phone numbers listed may only work for calls made from within that state. 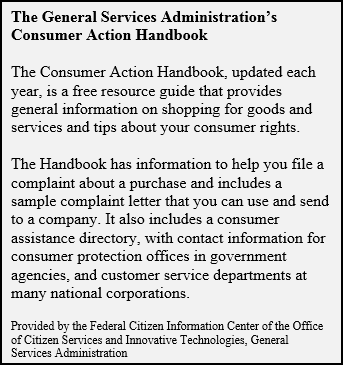 Click here to find the consumer agencies in your state. Below are several federal agencies that collect consumer complaints and use this information to monitor the industry they regulate. However, keep in mind that few of these agencies — notably the Consumer Financial Protection Bureau and the Federal Trade Commission — require a business to respond to your complaint. Not every federal agency that collects complaints is listed below. 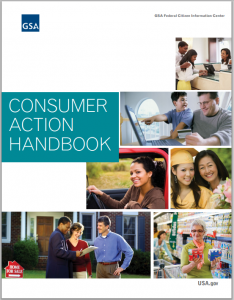 If you don’t see an agency that appears to accept your type of complaint, review the Consumer Action Handbook (above) as it will have additional information about filing consumer complaints. The Commodity Futures Trading Commission (CFTC) provides several ways consumers can file complaints or tips. Its reparations program provides an inexpensive, impartial, and efficient forum for consumer complaints against futures industry professionals for alleged violations of the Commodity Exchange Act (CEA). The CFTC’s Division of Enforcement investigates and prosecutes alleged violations of the CEA, and its Whistleblower program makes monetary awards to eligible whistleblowers. You can submit a complaint with Consumer Financial Protection Bureau (CFPB) which will forward your complaint to the company. The company must respond to you and the Bureau within 15 days. You will also be able to check the status of your complaint. If you don’t want to submit a complaint, you can tell your story. The CFPB says this helps inform how it works to protect consumers and create a fairer marketplace. Consumer Protect Safety Commission (CPSC) created a database to help consumers report unsafe products and research safety hazards with a wide variety of products. Reports about unsafe products help the Commission protect the public from unreasonable risks of injury or death. While the CPSC staff cannot respond to every report on an individual basis, the database helps the Commission identify trends in product hazards much more quickly and efficiently. If you have complaints about airline service other than safety or security issues, you can write a complaint to the Department of Transportation (DOT) here. All complaints are entered in DOT’s computerized aviation industry monitoring system, and are charged to the company in question in the monthly Air Travel Consumer Report. This report is distributed to the industry and made available to the news media and the general public so that consumers and air travel companies can compare the complaint records of individual airlines and tour operators. The Federal Communications Commission (FCC) handles a wide range of telecommunications service and billing issues. After you submit a complaint you will be given a tracking number to check on the status. Once all required information has been gathered, the FCC sends your complaint to the service provider and the provider is required to respond in writing to the complaint within 30 days, and must copy you on the response. Note that the FCC states that not all complaints are actionable or constitute a rule violation. You can submit a complaint to the Federal Trade Commission (FTC) regarding a number of issues. The FTC cannot resolve individual complaints, but it can provide information about what steps to take. The FTC says that complaints can help it and its law enforcement partners detect patterns of fraud and abuse, which may lead to investigations and stopping unfair business practices. Complaints are entered in its secure online database, which is used by many local, state, federal, and international law enforcement agencies. You can report a problem with a product that the Food and Drug Administration (FDA) regulates. Timely reporting allows the agency to take prompt action. The FDA evaluates each report to determine how serious the problem is, and, if necessary, may request additional information. You can also contact your state’s FDA Consumer Complaint Coordinator here. Note that several states may have the same Coordinator assigned to them. If you think there is a safety problem with your vehicle, tires, equipment or car seats, you can file a complaint with the National Highway Traffic Safety Administration (NHTSA) through its website safercar.gov. The complaint will be submitted to the Office of Defects Investigation, and while you may or may not be contacted by an investigator, all reports are reviewed and analyzed for potential defect trends. 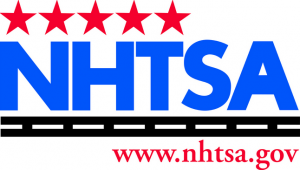 Additionally, NHTSA has information on recalls and defects. If you have a complaint, or would like to provide information about fraud or wrongdoing involving potential violations of securities laws, you can submit tips or complaints to the Securities and Exchange Commission (SEC). Staff in the Division of Enforcement evaluate information and tips concerning violations of the federal securities laws. The SEC conducts investigations on a confidential basis.